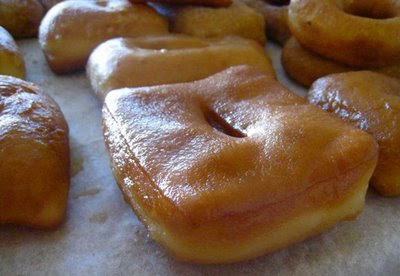 Edna Ruth Byler's Potato Dough Doughnuts have both fortified and funded many a Mennonite missionary. 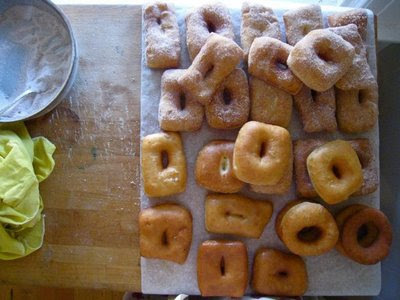 I tweaked the recipe just the slightest -- exchanging shortening for lard, margarine for butter -- and wound up with spectacular doughnuts (actually, their rectangularity means that they're fastnachts). Never mind that we're in the middle of Lent, when good folks eat neither sugar nor fat, and never mind that I'm in San Francisco's Mission District, which is rather the opposite of being a missionary. I'm trying. It's a new kitchen. It needed some cinnamon-sugared deep-fried aroma. I've upended myself and moved once again (that's move number three in the last twelve months; lagging behind last year's four-move record). Hence the hiatus. Um, and actually, I'm going to go take another nap-hiatus ahorita, so I'll post the recipe later. Perhaps I'll wait till after Easter so as not to lead you into temptation. 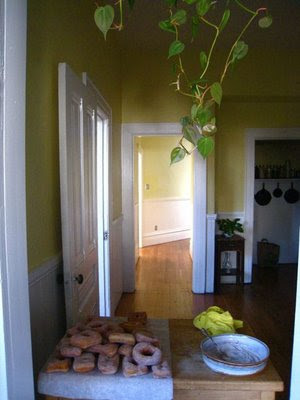 Your new place and your fastnachts are lovely. I've missed reading you. Damn, woman, those square beauties look good. I hear you had some time with Boney - I'm jealous. I hope she hops her way back here some time soon. Or maybe I should join you out there. Whenever I finish this degree. Awesome looking fasnachts. There better be a recipe by the time this semester lets out. I have no time for deep-fat frying til then, but I've got a tub of grass-fed, organic lard burning a hole in my refrigerator. I'm Mennonite and I Approve this message! Great to see fastnachts! Had some at the beginning of lent, and these surely look like the real deal! you need to post again.